In December, 1862 President Lincoln announced that he would free all of the slaves in the rebellious Confederacy. The astounding news spread rapidly throughout the Union. In Clinton, Illinois, a former officer in the 41st Illinois Volunteers and a former slave were convalescing from the Battle of Shiloh. They had served with honor at Fort Henry, Fort Donalson, and Shiloh's infamous Hornet's Nest. The officer was Colonel John Warner who had just completed service with the 41st. The former slave was Andrew Jackson Smith who became acquainted with the 41st after running away to Smithland, Kentucky. Andy's slave owner Elijah Smith had been quick to enlist in the Confederacy. He returned home on leave after a year's absence, and planned, as was the custom of many Confederate officers, to take his slave, Andy back with him. Andy, who was nineteen at the time, overheard the plans and decided to run away. Life was not easy for the young Andy. Fathered by his wealthy slave owner and birthed by a slave named Susan, Andy Smith was born into slavery around September 3, 1842. When he was ten years old, he was assigned by his owner to run a ferry transporting people and supplies across the Cumberland River. Andy became known as a Boatman and continued his craft for nearly eight years. During this time Andy learned the river, its currents, and the people. Furthermore, he heard the talk about the War, and he saw the Yankee ships, the steamers, the paddle wheels, and the Iron Clads. He was aware that the ships and the U.S. Troops were stationed up the river at Smithland where the Cumberland and the Ohio Rivers converged. Smithland was being used as a strategic military outpost by the U.S. troops who could control the movement on the Ohio and access to the Mississippi River from the north and the Cumberland from the east. Andy Smith and another slave decided to run to Smithland when they overheard their owners plotting to take them to serve the Confederacy. They walked the nearly 25 miles in freezing rain so cold that their soaked clothes froze to their bodies. They had to wait until daylight to present themselves to the 41st Illinois guards. They were admitted into the camp and given warm clothes and provided hot food. Andy later described joining the 41st as "falling in." And when the companies at Smithland rejoined the rest of the 41st Regiment at Paducah, Kentucky, Andy became a servant to Major John Warner in order to remain under the protection of the military. Major Warner and Andy had agreed that should the Major fall in battle that Andy would take the Major's belongings to his home in Clinton, Illinois. The Major wrote home advising his family of this arrangement. The 41st Illinois Volunteer Regiment moved on to Fort Henry for battle. The battle was short but successful. The fort fell and they captured Confederate General Lloyd Tillingham. The 41st moved on to Fort Donelson where the unit encountered fierce resistance and lost over 200 men. On March 10, 1862, the 41st Regiment traveled to Pittsburg Landing (Shiloh). Prior to this battle, Major Warner had asked Andy Smith to observe him, and if he should fall, he wanted Andy to bring him water. During the battle the Major had his mount shot from under him. When he got up, there was Andy with another mount. Shortly afterwards when the second mount was killed, Andy caught a Confederate horse and gave it to the Major. Andy asked if he could stay close to the battlefield. Before he could walk away he was struck by a spent minie ball that entered his left temple, rolled just under the skin, and stopped in the middle of his forehead. As Andy laid his head upon the regimental surgeon's bloody apron, the surgeon removed the ball after which he pulled a sponge through the wound to cleanse it. Andy carried the scar to his grave seventy years later. John Warner returned to Clinton, Illinois as a Colonel in November of 1862, along with Andy who continued to serve him. Andy was in Clinton, Illinois when he heard the news that President Lincoln had acquiesced and permitted black troops to fight for their freedom. Andy Smith left the safety of a free state to enroll in the 54th Massachusetts Colored Volunteers. Massachusetts' Governor John Andrew had requested 1000 black men, and he got nearly 2,000 so quickly that he had to disband the 55th Massachusetts regulars to handle the overflow. The 55th was renamed to accommodate the colored recruits. Andy Smith and 55 other Illinois volunteers were mustered in the 55th Massachusetts Colored Volunteers. Andy mustered into Company "B" on May 16, 1863. After the 54th Massachusetts Volunteer Regiment's engagement at Fort Wagner, South Carolina on July 18, 1863, the 54th and the 55th fought five military engagements together over the next three years. They fought both on and off the battlefield. They fought and won the battle for equal pay with white soldiers. But in order to receive his pay, a black soldier was required to nod his head (yes) when asked if he was free in 1861. Andy refused to nod and lie about his status prior to 1861 in order to receive his pay. 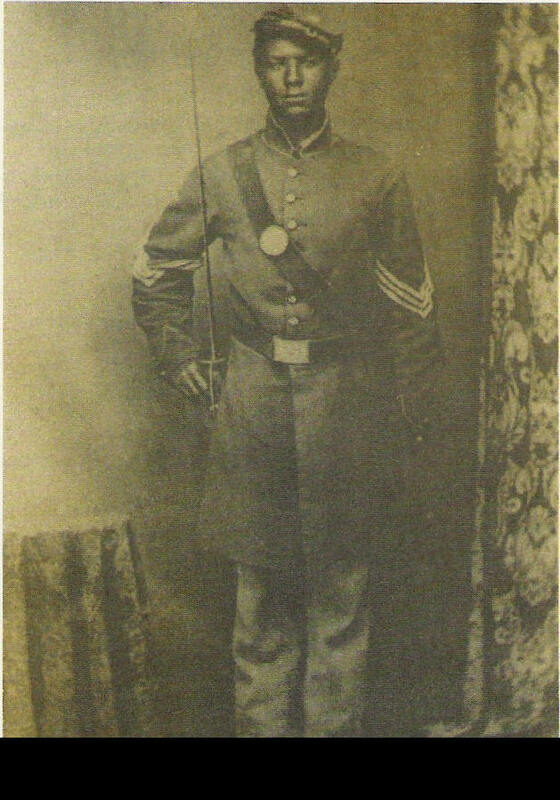 Andy Smith was fortunate that he did not receive any other serious wounds during his 55th Massachusetts enlistment even though he served in the color bearer unit. He was always in the thick of battle and volunteered for many raids among the islands along the South Carolina and Georgia coasts. Andy won his distinction at the Battle of Honey Hill, South Carolina when the flag bearer was blown to bits by an exploding shell. Andy caught the falling Color Sergeant Robert King with one hand and snatched the flag with the other. Lieutenant Ellsworth who was the commander at the time screamed at Smith, "For God's sake, save the flag!" Smith carried the colors during the rest of the battle. As he was leaving the field at Honey Hill, the regimental color sergeant was wounded, and Andy left the field of battle bearing both flags. Had his actions been properly recorded that day, he certainly would have been rewarded with the Mdeal of Honor for his bravery under fire. The regimental commander, Colonel Hartwell was severely wounded and carried from battle early in the fighting. He was forced to complete his battle report at his home while recuperating from his wounds. Had the colonel been present for the remainder of the battle, he may have reacted differently to Andy's bravery. Andy was promoted to Color Sergeant soon after the battle. The 55th Massachusetts Colored remained in the area and was later detailed as provost guard at Orangeburg, South Carolina. Andy received his final discharged at Mt. Pleasant, South Carolina on August 29, 1865 and was sent to Boston on the Steamer Karnac for his formal mustering out. After the War, Andy went back to Clinton, Illinois for a short period. He later returned to Eddyville, Kentucky where he used his mustering out pay to buy land. Dr Burt G. Wilder who was the regimental surgeon for the 55th Massachusetts began a lifelong correspondence with Andy Smith in hopes of securing the cherished Medal of Honor for Andy's bravery at Honey Hill. So many of the officers were wounded and taken from the battlefield that the battle was never fully documented and Andy's heroics could not be certified.